4 months ago, 27-year old JewishMOM Puah Palmer endured every mother’s worst nightmare. In a single day, this young wife lost her husband, Asher, and her year-old son Yehonatan in a terror attack when they were driving towards their home in Kiryat Arba. 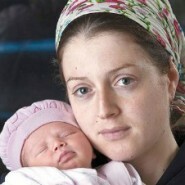 B”H, last week Puah gave birth to a baby girl whom she named Orit. May Puah Palmer be comforted and blessed with abundant nachas from her newborn daughter, and may she, from now on, be bless with only good news and mazal tov! What a beautiful baby! May she always bring you much nachos and joy. She’s the hat kid! Gotta love that hat! If you ever see this, my condolences on the loss of your husband and son. May Orit bring you many years of joy and happiness. I will be praying for you. I am at a loss for words. How can we ever understand Hashem’s ways? May Hashem protect you from any further suffering and give you nechama. I wish I could hug you both. Please keep us all updated, you surely will be in our hearts. How can it be possible for people to do such horrible things to a baby. From the bottom of my heart Mrs. Palmer I send my condolences on the loss of your husband and son. May God bless you and your daughter from now to eternity. I just cried. Puah, may you be blessed with a long, healthy and happy life with your beautiful daughter. What a wonderful comfort. Asher seems to be the best man in this world and its sad his kid was also killed – he was onl 24 yrs old at the time of his death. May God Bless their Souls.